I know what you are thinking. Two white handbags featured in two weeks, really? How many white leather handbags does a person need? I get it. But the Botkier Trigger bag is my all-time favorite, so I couldn’t resist sharing this wonderful sale find. 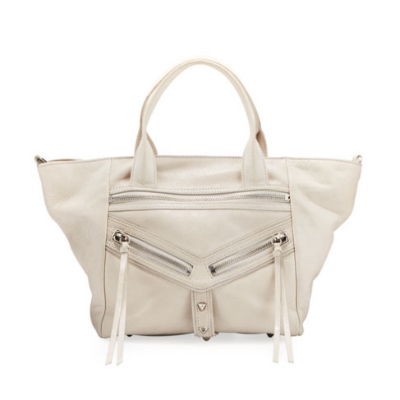 This creamy off-white satchel features all the zips, pockets, and pulls that are the hallmarks of the original Botkier design. My first Trigger was a black leather “Trigger Clyde” purchased from the now-shuttered South Coast Plaza outpost of So Cal fashion institution Ron Herman. I was instantly in love. Over the years I’ve acquired three more Triggers, but not one in white! This convertible Trigger satchel comes with both 6.5” drop top handles and a removable 15” drop shoulder strap. It’s good to have options. The top zips closed to keep all your goods packed up tight, while the exterior zip pockets let you put the necessities where you can get to them quickly. The quirky geometric pattern lining is icing on the cake. → Buy the Botkier Trigger Convertible Leather Satchel Bag, $199.50 (was $348.00), at lastcall.com; this item ships free with code LCSHIP.